The blouse consists of several frieze patterns that adorn the front and sleeves.The blouse consists of several frieze patterns that adorn the front and sleeves. 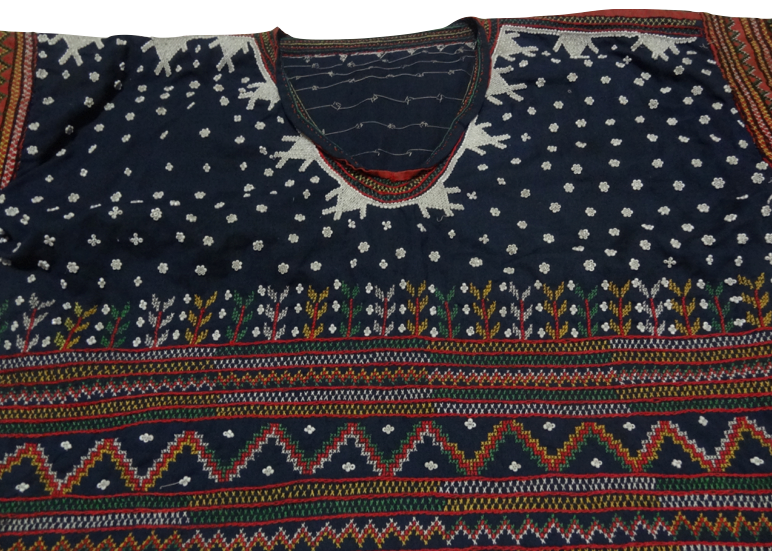 The frieze pattern of embroidered beads around the neck consists of anthropomorphic forms. The symmetry group of this pattern is m1. There are vertical reflections spaced half the translation length. The first frieze (topmost layer) decorating the front of the blouse has leaf designs. Its symmetry group is also m1. The frieze patterns (see below) consisting of “v” designs have symmetries consisting of vertical reflections, 180° rotations and a glide reflection. The symmetry group is mg.